For more than 35 years, Dr. R. J. Gutiérrez has been an international leader in the study and conservation of owls. Over the course of his career he has published more than 120 scientific papers on owls and has obtained millions of dollars in research funding to advance our knowledge of owls. Dr. Gutiérrez’s long-term research on the Spotted Owl in western North America deepens the world’s understanding of this rapidly declining species, including their demographics, habitat, behavior, biology, and ecology. Similarities and differences in the Northern, Mexican, and California subspecies of the Spotted Owl are better known due to this extensive body of research. His complex demographic studies of the Spotted Owl led to advances in statistical analysis of data that benefit studies of other owl and wildlife populations. The rigor of Dr. Gutiérrez’s research on the Spotted Owl provides a reliable foundation for conservation planning, forest management, and species recovery strategies. He collaborates with federal, state, local, and private entities to advance conservation efforts. Because the status of the Spotted Owl generates intense public interest, Dr. Gutiérrez is often called upon to share his expertise in public presentations, professional conferences, consultations, and media interviews. This intense interest has also led him to study conservation conflicts specifically surrounding the Spotted Owl and generally surrounding wildlife problems. His contributions to research and conservation have been widely recognized with many prestigious awards. Dr. Gutiérrez is known as an inspiring educator in the field of wildlife biology and conservation. As a university professor he has mentored more than 40 graduate students; 29 of whom studied owls. Many of his students have gone on to their own careers in owl conservation and research. Currently, Dr. Gutiérrez is the Professor and Gordon Gullion Endowed Chair Emeritus, in the Department of Fisheries, Wildlife and Conservation Biology at the University of Minnesota. 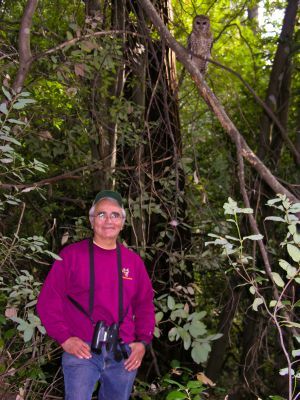 Although officially “retired”, Dr. Gutiérrez remains actively engaged in research and conservation of the Spotted Owl. ​In remote forests of the Russian Far East, Dr. Jonathan Slaght studies the largest owl in the world – the secretive and endangered Blakiston’s Fish Owl. He traces his interest in the fish owl to the year 2000, while he was working in Russia as a Peace Corps volunteer. 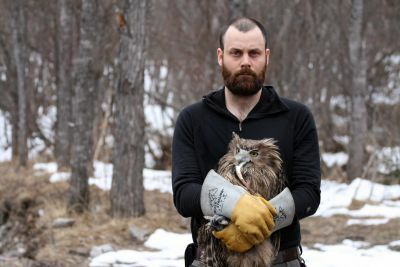 Dr. Slaght later completed his PhD at the University of Minnesota, focusing his research on habitat selection patterns, home range size, and population status of the Blakiston’s Fish Owl in Russia. His research significantly expands the world’s understanding of the fish owl and provides a strong foundation for conservation planning. He is widely recognized as a world expert on the Blakiston’s Fish Owl. Dr. Slaght is a co-founder of the Blakiston’s Fish Owl Project, a collaborative research effort to monitor fish owl territories and conduct proactive conservation measures in Primorye, Russia. Fluent in Russian, he has developed relationships with Russian scientists, logging companies, and organizations to promote fish owl conservation efforts for more than a decade. Dr. Slaght has worked for the Wildlife Conservation Society since 2011, where he is now the Russia and Northeast Asia Coordinator. He is involved in research and conservation projects of owls, tigers, and musk deer. He serves as a mentor to Russian graduate students studying owls and other wildlife. In addition to his research and conservation efforts, Dr. Slaght collaborates with international colleagues to advance knowledge of this rare owl and has authored many publications in the scientific and popular press. He regularly translates books and articles from Russian to make them available to the broader world. He has been very active in public education through oral presentations, television appearances, and contributions to popular publications in the U.S., Russia, and Japan. Dr. Slaght’s online presence in websites and blogs, including a column on Scientific American, brings the Blakiston’s Fish Owl to people around the world… complete with photos and owl calls. Mr. Sumio Yamamoto traces his fascination with owls to a chance encounter with an owl in the woods of Japan when he was just a child. This early interest grew into a lifelong journey with owls. He has devoted his adult life to the study and conservation of the rare Blakiston’s Fish Owl in Japan. His long-term research into the characteristics, behavior, and natural history of the fish owl contributes greatly to the world’s understanding of this reclusive and endangered owl. 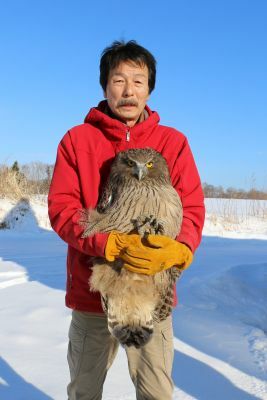 Mr. Yamamoto’s studies of captive rearing, including artificial incubation, raising chicks, and fostering abandoned owls are unique and provide a foundation for fish owl rescue and rehabilitation. “Don”, his rescued fish owl, gives the Japanese people a wonderful opportunity to observe this impressive bird that they are unlikely to encounter in the wild. Conservation of the fish owl, including habitat improvement and mortality reduction, is the focus of Mr. Yamamoto’s tireless work. Much of the old growth forest that the fish owl requires, has been lost to logging and development in Japan. He has successfully developed techniques for artificial nests and supplemental fish ponds to improve the available habitat. Experimental efforts to reduce nest site disturbances and automobile collision mortality are ongoing. Mr. Yamamoto collaborates extensively with the government of Japan, the Japanese public, and scientists around the world to preserve and protect the fish owl. He shares his knowledge and passion for the fish owl in educational programs, interviews, and field trips. His book “Shima-fukuro – The Blakiston’s Fish-Owls” (1999, Hokkaido Shinbun Press, Sapporo, Japan) provides a detailed look at the natural history of this owl. Mr. Yamamoto is recognized as a world expert on the Blakiston’s Fish Owl and his work contributes to the efforts to save this species.